gastroPod Miami – Miami, FL (@gastropodmiami) – Food Truck Talk – Searching for the best foodtrucks! 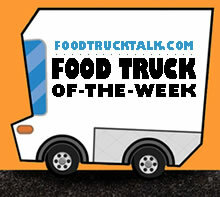 Congratulations to gastroPod Miami as FoodTruckTalk.com’s Food Truck Of-The-Week! In 1962 the Best Picture Academy Award went to Lawrence of Arabia. The #1 song was Peppermint Twist by Joey Dee. The Beverly Hillbillies was the most popular TV show. 1962 was the year of the Cuban missile crisis. 1962 was also the year that Chef Jerimiah’s shiny Airstream trailer was built. 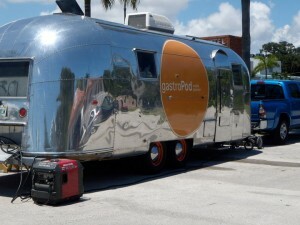 Today that vintage trailer houses gastroPod Miami one of South Florida’s most popular food trucks. Chef Jerimiah brings together Latin and Carribbean tastes and flavors with extremely creative cooking techniques and great quality food. His Bullfrog Eatz restaurant is legendary, and gastroPod is become just as famous. The Old Dirt Dawg is often the spotlight item. 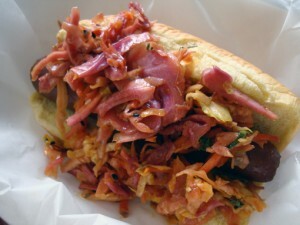 It’s a hot dog, but not any hot dog, this one is made from short rib, on a potato bun and topped with stupid slaw. The mo’ Better Bacon Burger is short rib with brisket, sirloin and bacon! Order it “dirty” with slaw and a poached egg. Also available are the Sloppy Jose, slow cooked beef brisket covered with tangy espresso que sauce on white bread or the Pulled Pork Sandy, smoked and pulled pork topped with pickles. Vegetarians are not left out as Curry in A Hurry is a vegetarian curry served with rice. Chef Jerimiah sure seems to love pork, and he prepares it perfectly every time. Check out the Bahn Mi Tacos with pulled pork, cilantro and a secret gastroPub sauce. Menu items come and go, but you are guaranteed a creative and flavorful experience served to you by nice people from a 1962 Airstream.